Serenity Now: My 100th Post Giveaway! How did I get to 100 posts?! 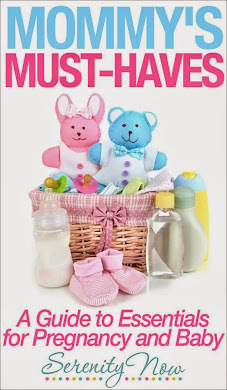 I started this blog in February of 2008, as a way to find some means of creative expression that wouldn't require me to beg T to father babysit a crazed two year old and a mama's girl newborn while I went out to take a breather. I needed to find some serenity; I needed to feel like me again. It was difficult staying home with two teeny ones and not feeling like I had much contact with the outside world most days. 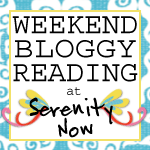 So, "Serenity Now" really sprang up out of desperation! Blogging is free, I can do it at home, and I can write my posts before the girls are awake. The icing on the cake is the fact that I've "met" so many friendly, creative, kind people just by logging on! After a very slow start and some time off, I found Big Mama's blog, got hooked, and became simply addicted to reading blogs. Hey, I thought, she's funny...I'm a little funny, maybe I could start up again. I love, love, love reading what each of you are up to in your daily lives, whether it's crafty things you are creating, the recipes you are testing, or the funny or inspirational stories you have to share...I love all of it! I might not have 1400+ Followers like The Nester, but I sure am enjoying writing for those of you who do stop by...and most of all, I am loving writing for the "exercise" it offers me! Thank you for the kind, encouraging comments you leave for me. If you decide to stay, or "follow," I'll do my best to keep you smiling! To thank you for stopping by, I'm hosting my very first GiVeAwAY! 1. If you leave me a comment on this post, between now and Monday, April 13th, at noon (EST), I will enter you in the drawing! 2. If you post a link to my blog on your own blog, I'll add in an extra entry in your name. 3. If you are a follower (or sign up to be a follower), that's another entry for you! 5. I will announce the winner of the giveway on Tuesday! What's the prize? Oh, yeah...it might be nice if I got around to mentioning it, huh? This book rocks my world, ya'll! There are several in this series. I haven't checked out the kids' version yet, and this one is not the book that exposes all the horrid caloric nightmares in our favorite restaurants (which no one can afford to eat at right now, anyways). 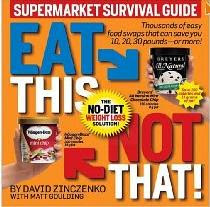 I decided on the Supermarket Survival version because I found it fascinating to thumb through and see items that I thought were relatively safe listed in the "Not That!" category. T was deeply grieved to learn that his favorite Life cereal did not make the "Eat This" list. Since I haven't read the kids' one yet, I couldn't recommend it, and this one seemed like it would be helpful to just about anyone who has ever been to a grocery. I know I have a few (maybe one or two?) male readers, so this one doesn't leave you out, fellas! Eat This, Not That! could be a great helper to you as you shop for afforable and healthy meal choices for your family. I hope to hear from lots of you (lurkers too!). I can't wait to announce the winner! If you're new to my blog, here are a few of my favorite posts. I recently heard about this book series and thought they look really, really good. YES! Please enter me in your giveaway!! The book looks interesting, AND congrats on your 100Th!!! Cheers, and here's to more of your amusing posts in days to come! Congrats on your 100th post! Blogging is sooo much fun! Woo Hoo, looks like a great book! I will definitely be mentioning you on my blog and sign up to follow yours. :) I look forward to reading it every day! Woo-hoo, congratulations on #100!! You get an A+! Enjoy this gorgeous day. I checked out the BIG MAMA site and you're right, It's a funny one. Oh! I really want to read this book. I've been trying to get it from the library, but it's always out. Winning it would be even better! Congrats on 100 posts! I loved what you said in your first paragraph too about blogging being a way to express yourself and reclaim your individuality. I think sooo many of us feel that way. BTW - I'm still thinking about your post the other day about the craziness of being a mom and repeating to yourself "serenity now, serenity now...". What a crack up! Congratulations my dear Amanda on reaching this milestone. Looking forward to many more on your blog! This book would definitely get it's use in my house!! And it would surely help my husband when he grocery shops :D ! I have posted about you and your giveaway on my blog with a link, and I am a follower on yours as you know. Please enter me! Thank you for the wonderful comments you left me on my blog!! Have a blessed and serenity full day! I'm a follower! Thanks for a fun giveaway! That book looks so interesting! How fun - I found you from a coment you made on "Balancing Beauty and Bedlam"'s site - and I love giveaways! I have 2 little girls too and we are on opposite ends of the country - I live in WA state. Nice to meet you and the book looks very fun! Amen sister friend! I love how blogging has changed my life...for the better. A year ago, I would have laughed and ridiculed anyone for making that same statement. I have learned so much, made so many treasured friends (your on my list, BTW), and feel like I have a really productive creative outlet. I sound like an infomercial for blogging...sorry. Anyway, huge kudos and CONGRATS on your 100th post. I am soooooo glad we've become friends. Oh...and how had I missed the follower boat? I'm so following you...now it's official! What's wrong with Life cereal!? Ahhh...that's my baby girls favorite! Only she calls it "square cereal". Now I'll be devastated if it's no good for you! I didn't know that I wasn't officially "following"...I do that a lot. Visit someone so often that I don't realize I'm not actually following. I am now though! Well hot diggity! I posted my 100th yesterday and am am doing a give-away too! Hop over and enter to win some delicious German goodies (way different from the sweets we have in America). Congrats!! On the 100th post. Found you through 50's Housewife, so now I'm following you too. I'm new to your blog and it's great! I became a follower today (but before I saw your giveaway). I'll send you some love from Eventually Cottage for your giveaway. that book looks like it would be a good one to have! Congrats Amanda. I feel like a little fish in the big ocean when it comes to your blogs. I LOVE READING YOUR BLOG!!! You make me laugh, cry and envy the life you live with your wonderful family. Keep up the good work. Anyway, I've heard great things about this book so sign me up!! I very much enjoy reading your blogs. You have a wonderful gift that God has blessed you with. Thanks for sharing your talent with others. I've heard about those books, but never actually read one. Great idea to have a giveaway.